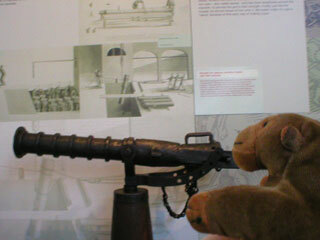 "What a wide variety of historical artillery things"
Inside Firepower, Mr Monkey started by visiting the History Gallery, which, surprisingly, deals with the history of artillery. Up to the end of the 19th century, anyway. The 20th century isn't history yet, it seems. 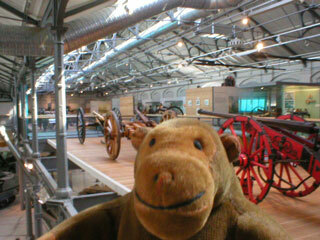 The bright red cannon behind Mr Monkey is a falconet from the English Civil War; Mr Monkey was also very interested in the oldest breech loading cannon in England.